In many cases studying for a new language is extremely difficult. It doesn’t matter if you are about to learn a completely new language, or just to “update” the knowledge of an already learnt one. 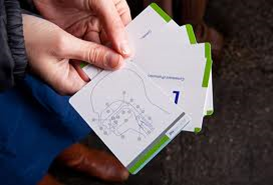 Probably the easiest way to enhance your knowledge is via flash cards. Just place the term on one side, and the meaning on the other side…and that’s it – via this method you will see how easy is to learn new language and you will also have fun at the same time. 1.The first thing you need to do is to evaluate the needs that you have to learn. Also, the flash cards should never use more than one chapter of the material, because if you make this mistake you will not learn anything. Always remember this. For example, if you are using Spanish, create a set of flash cards for greetings and different answers, also use a various set for the vocabulary talking about items (household), another set for locations, and so on. For online flash cards you can visit Cram as well. 2.Write the list of phrases and terms that will go on one flash card. Once again, make sure that everything is correct. The translation and the spelling must not have mistakes and the terms should fit into the current topic. If the list to become too big, it might not be a bad idea to remove some of the terms in order to shorten the list and then try to recompose it again. 3.Write the phrases and terms on the one side of the cards. It might be a good idea to use good materials for your cards because if you don’t, there is a risk for the card to bleed through the other side and as you know this should not happen because you will be able to see the right answer. 4.On the back side of the card you should write the translation. Once again, double check to make sure that the ink isn’t bleeding through the card because if so – the learning process will not be as effective as you wish it to be. Another good idea you might use hints, if you are unable to remember the word, then use various hints written on the card. This will definitely help you. 5.The last thing you have to do is to stack up the cards in different variants and start learning. It is a good idea to shuffle them every once in a while in order to have their positions changed. You will see that the results will be better than expected thanks to the usage of this simple and yet effective method. So now you’ll have no worries regarding the learning of a new language as flash cards let you learn anything quite simply and quickly in an amusing manner. Just give it a try!